CLOVERLEAF, TX (KTRK) -- Families in the Cloverleaf area are cleaning up after Saturday's flooding. Homes along Fleming Drive had some of the worst damage, after nearly four feet of water rushed inside. The Arizmendi family took us inside their duplex to get a closer look at the flood damage. "When we left at 3 in the morning, the water was right here and now it's up here," said Ivan Arizmendi, pointing at first to a spot three inches above the ground, then raising his hand to the four foot water line on the wall. "Everything is destroyed," Arizmendi said. He and his brother took us through room after room, pointing to muddy clothing, soaked photographs, ruined electronics. Debris was everywhere. The carpet, still soggy from sewage water. "My aunts and grandma are crying and they feel sad. Because in the living room their couches are flipped over," said Gustavo Arizmendi, Ivan's 8-year-old brother. Next door to the Arizmendi family, the Barrientos family is going through the same thing. "We lost everything," said Angel Barrientos, who lives in the duplex with his mother and grandmother. He says everything happened so fast-his family didn't have time to pack up and save some of their prized possessions. "As soon as I opened the door to push the water out all the water just came in," Barrientos said, explaining how he tried to push the water out with a broom. They say they plan to contact the Houston Red Cross for help, but like so many families, aren't sure where they'll go. 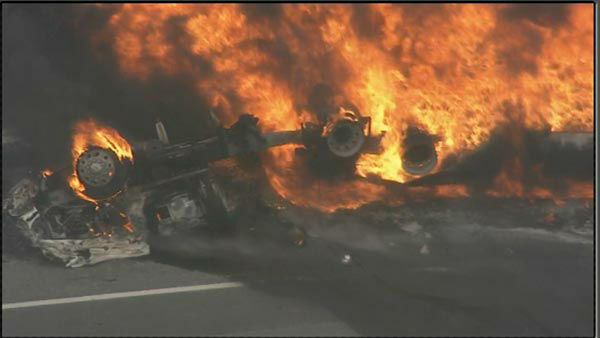 See photos from the tanker truck fire on the ramp from Rt. 90 to Rt. 130 in Pennsauken.